If there is one thing I have learnt about my ancestor Giovanni Battista Falcieri, as I have worked on my biography of him and the film script that seeks to bring his story to life, it is that he was an absolute nightmare to live with. For this man he had a great respect, and used to relate a romantic adventure which first introduced them to each other. I believe it had reference to an encounter with banditti, when Lewis was travelling in Italy, from whom Tita had aided his escape. 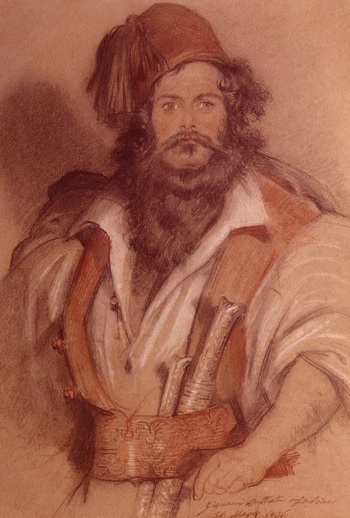 A cocked hat with a plume of feathers, scarlet coat, richly embroidered with gold lace; pantaloons, also similarly embroidered; Hessian boots, with tassels; sword and sash completed his equipment when out on special occasions in attendance of his Lordship. Lord Byron did run a rather disorganised household, that much is evident. Richard Hoppner, the Venice Consul, described Byron as being “culpably lenient” with his staff and that “he rather bantered with them than spoke seriously to them”. When they were in Venice, Tita swam with Byron in the Grand Canal, they rode out together on horseback, and he was responsible for ferrying Byron to and from his various amorous liaisons, of which there were many. Bad habits set in early. Byron bailed Tita out each time he came up against the authorities, paying his fines, and a generous sum to allow him to avoid conscription in Venice. Later still, he paid his father an annuity to compensate him for Tita leaving Venice and abandoning the family business at the Palazzo Mocenigo, where he and his brothers were all gondoliers. On one occasion, in Venice, when some police came to take him up for some offence, he looked at them and smiled, telling them they had better not venture. They attempted to take him, and he threw three of them into the street, while the other four took to their heels. The Commandant of Police went to Byron, and Byron went to the Grand Duke. His Highness remarked that it would be ‘all right’, as the men ‘were being attended to in hospital! The officer in question [Masi] has not died which is fortunate. However, our imprisoned servants have been kept a fortnight on jail allowance without being allowed to see any friend, not even their wives, or to receive any assistance, or even a change of linen from their friends. Even so Lord Byron has sent them down a 12 course dinner to share amongst their fellow prisoners, their only companions. At four o’clock, after this consultation of his physicians, [Byron] seemed to be aware of his approaching end. I think this was the exact time, and not before. Dr Millingen, Fletcher, and Tita were round his bed. The two first could not contain their tears, and walked out of the room. Tita also wept, but he could not retire, as Byron had hold of his hand; but he turned away his face. Byron looked at him steadily, and said, half smiling, in Italian—Oh questa è una bella scena. Tita accompanied Byron’s body back to England aboard the Florida, sleeping with the coffin – faithful bodyguard to the very last. He also followed the funeral cortege to the tomb at St Mary Magdalene, close by Newstead Abbey, the ancestral Byron home. Just over a year later, still in England and working for John Hobhouse, one of Byron’s closest friends, Tita decided to return to Greece He joined Pietro Gamba, whom he’d met while working for Byron, and remained in Greece until the close of the War of Independence in 1828, when he returned to England and joined up briefly with what remained of Byron’s old household in London. From 1832 to 1848, Tita lived in the Chiltern Vale in Buckinghamshire, serving in the household of Benjamin Disraeli’s parents. But despite his advancing years, he still managed to get himself into scrapes: he was hauled in front of magistrates, accused of attacking one of the local lads in the village (of which he was found innocent) and quarrelled with staff who were then sacked. He almost eloped with one lady’s maid and secretly married another whilst still in service, and he was well known for taking impromptu holidays down to London to visit old friends. Amazingly enough, the D’Israelis even put off house guests one Christmas so Tita could ‘enjoy the holidays’. Throughout his career Tita always regarded himself as an ‘obedient, faithful servant’, even though the evidence suggests he was rather negligent of the niceties required of an effective valet, and rather managed his masters than the other way round. He spent nearly 30 years in the service of others – six years with Byron, six or so with Lewis, Shelley, Hobhouse and others, and sixteen with the D’Israeli family. After this he turned his back on valeting, and spent the last twenty six years of his life at the Board of Control, later the India Office. During what seemed his convalescence, Falcieri occasionally hobbled down to the India Office, where I had a conversation with him a month before he died. The old fire seemed to be hovering about his eye; and I could not help thinking of ‘Tita’ as one of the few men in London who connected the past romantic and poetical age with the distracting, too-fast, and ever busy present. Claudia Oliver is a writer and fashion designer and currently lives in Manchester. Claudia’s interest in Lord Byron began when she discovered her great-great-great-grandfather was his gondolier and bodyguard Tita Falcieri. She published her biography of his life in 2014 and a revision is due out in 2017. She has contributed to various publications and has appeared on TV and radio in connection with her research. As well as running her own business, Claudia now works at Newstead Abbey and continues to research and write about her genealogy. She is currently working on a film script about Tita’s life.